Studies in the past have claimed that a Mediterranean-type diet can help to tackle certain health problems, including those relating to our tickers. 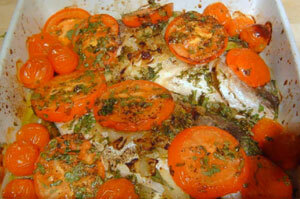 So, by following this simple yet tasty recipe you can perhaps benefit from eating Baked Sea Bream as well as enjoy it! 1. Peel and slice the potatoes and line a baking dish with them. Slice half of the lemon. After seasoning the sea bream with salt, make three incisions and add the lemon slices. Place the fish on top of the potatoes. 2. Apply 2 tbsp of oil to the fish and cover with tinfoil. Place the dish in a pre-heated oven at 200c for 25 minutes, occasionally basting the fish. 3. Then, take the tinfoil away and place back in the oven for a further 10 minutes to allow the fish to go slightly crispy. 4. While the potatoes are browning, heat a pan and add the remaining oil along with sliced garlic. Cook through and then add the chilli and parsley (chop first). 5. Pour the contents of the pan over the fish when serving and season well. Squeeze the remaining half a lemon and add the juice to the dish.